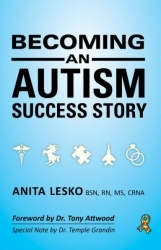 Anita Lesko author of "Temple Grandin: The Stories I Tell My Friends," is an internationally recognized autism advocate and member of Autism Society of America's Panel of Autistic Advisors. She was diagnosed with Asperger's Syndrome at the age of fifty. A graduate of Columbia University, Anita was an honored speaker at the United Nations Headquarters for World Autism Awareness Day 2017. Arlington, TX, April 03, 2019 --(PR.com)-- "Becoming an Autism Success Story" is now available from Future Horizons. - Hard work and childhood jobs to build skills. - And most importantly: patience and perseverance. Some of the highlights of Anita’s life story include graduating college and going on to become a certified registered nurse anesthetist, getting married to her husband in an all-autism wedding, excelling as equestrian and jumping fences up to six feet tall, and even flying in an F-15 fighter jet! Through the framework of her impressive life, Lesko proves that you can do anything you set your mind to - and teaches you how to do it yourself.